Everyone is calling for smart growth...but what exactly is it? In The Smart Growth Manual, two leading city planners provide a thorough answer. From the expanse of the metropolis to the detail of the window box, they address the pressing challenges of urban development with easy-to-follow advice and broad array of best practices. 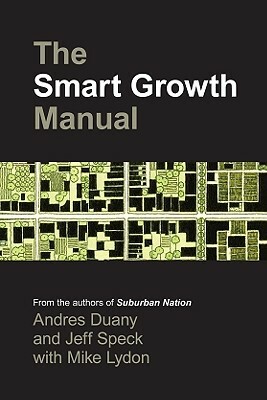 "The goal of The Smart Growth Manual is clear from page 1: to create a guidebook for smart growth following the pattern of the Charter for New Urbanism. Duany, Speck and Lydon have achieved that in spades (the Charter is included in the appendix, in case we missed the connection). It even clears up some of the architectural arguments that attach themselves to New Urbanists, such as this segment of Section 14.1, Regional Design; 'While new buildings should not be compelled to mimic their historic predecessors, designers should pay attention to local practices regarding materials and colors, roof pitches, eave lengths, window-to-wall ratios, and the socially significant relationship of buildings to their site and the street; these have usually evolved in intelligent response to local conditions.' In addition to making the old 'traditional vs. modern' argument irrelevant, Duany, Speck and Lydon have truly managed to boil down the best parts of current practices into a highly readable, portable book." Andres Duany, FAIA, CNU, is a founding principal of Duany Plater-Zyberk & Company (DPZ). DPZ is a leader of the New Urbanism, an international movement that seeks to end suburban sprawl and urban disinvestment. Since 1980, DPZ has designed more than 300 new towns, regional plans, and community revitalization projects. Duany is cofounder of the Congress for New Urbanism and the recipient of several honorary doctorates and awards, including the National Building Museum's Vincent J. Scully Prize and the Richard H. Driehaus Prize. Jeff Speck AICP, CNU, LEED-AP, Hon. ASLA, spent 10 years as director of town planning at DPZ, where he led or managed more than 40 of the firm's projects. Subsequent to the publication of Suburban Nation, he was appointed director of design at the National Endowment for the Arts, where he created the Governors' Institute on Community Design, a program that brings smart growth techniques to state leadership. After four years at the Endowment, he founded Speck & Associates, a design consultancy serving public officials and the real estate industry. He is a contributing editor to Metropolis magazine. Mike Lydon CNU, is an urban planner, writer, and livable streets activist. Before founding The Street Plans Collaborative, an urban planning firm specializing in alternative transportation and the public realm, he worked for DPZ, the Massachusetts Bicycle Coalition, and Smart Growth Vermont. He is currently a Next American City Urban Vanguard and serves as a board member for the Miami Bicycle Coalition.